The next Mythical Pokemon distribution to celebrate Pokemon's 20th Annivesary in 2016 is now live in North America and Europe. 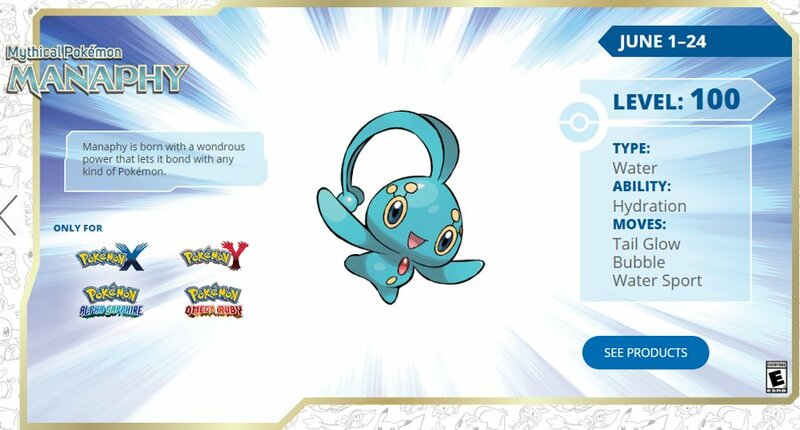 June's event Pokemon is the Sinoh Legendary Manaphy. The Manaphy is Level 100 and comes fully equipped with the ability Hydration and the moves Tail Glow, Bubble, and Water Sport. This Level 100 Manaphy is rare to come by, so make sure to get it before June 24. To receive the Manaphy, select the "Mystery Gift" option in Pokemon X and Y, or Omega Ruby and Alpha Sapphire versions. Proceed to choose the "Get via Internet" option. Head into the game and speak to the lady that's waiting in any Pokémart to claim your Manaphy. Since this is a Nintendo Network event, you can even get a seperate Manaphy for every version of X, Y, Omega Ruby, or Alpha Sapphire you have!